There are several target groups when it comes to self-help books. There are the die-hard devotees, who pick up every single one with the intention of making their life as spiritually fulfilling and motivating as possible. There are the slightly less-than-confident people who are looking for guidance and believe that a book may provide the answer. There are the sceptics, who doubt they can glean much insight but are willing to test the theories that can be found in self-help books (and get a laugh along the way if all else fails). And then there are those who have hit rock-bottom, who rely on self-help books as an alternate (and cheaper) form of therapy to get them out of their slump. 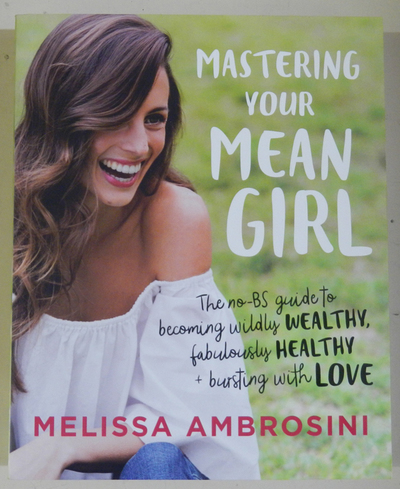 I have to admit that I’m probably more in the third category (with possibly a hint of the second), when it comes to these books which are meant to inspire and motivate, and I was hoping that the newest offering to the self-help club- Mastering Your Mean Girl by Melissa Ambrosini- might help to change my mind. Alas, it didn’t. That isn’t to say that her book isn’t stimulating, because I’m sure the content would provide inspiration to many women who face self-esteem issues and the like, but it just didn’t really do it for me. Ambrosini, best known for her motivational speaking and entrepreneurship, has written this book, hoping to encourage women to put their ideologies of imperfection to rest, and in turn, inspiring them to reject fear and embrace love. She has detailed some of her past struggles in the acting and modelling world, her body’s decline as she tried to keep up with the boozing of her friends, her toxic relationships and her gradual realisation that she was horribly mistreating herself. Having hit her own personal ‘rock bottom’, she started reading self-help books, began meditating, ate healthier and generally started treating herself better. Her main achievement, and the theory that forms the basis for her book, was that she mastered her mean girl- the little voice inside her head that was telling her that she wasn’t (and never could be) good enough for anything positive to happen in her life. Hoping for all women to achieve this same realisation, she has detailed the ways in which to reject fear, embrace love and become a better person, thereby reaping the benefits of good karma. Strongly encouraging self-love, healthy eating, meditation, and positive affirmations, she strives to help her readers achieve a healthy, wealthy and loving lifestyle. By sharing her stories, and writing in a conversational manner, it is easy to see how Ambrosini has become such a successful life coach. Her book is full of references to love, souls, positivity, and spirituality. It also features hundreds of pictures of her, scattered throughout the pages of the book, so if you’re not interested in seeing images of her in a variety of carefree poses and outfits, it’s probably best to steer clear. That said, the message she is trying to share is important for women of all ages, and even if you’re a partial sceptic like me, you can probably glean a positive note or two by reading this book.